Like most of the things involved in this shooting business, just saying something doesn’t make it so. If you are serious about handgun hunting, however, here are a few tips that will get you headed in the right direction. CALIBER SELECTION: Remember that any handgun is not as powerful as most popular hunting rifles. Your hunting handgun should be chambered for the most powerful caliber that you can handle accurately. And, if you can’t handle at least a .41 or .44 Magnum with hunting loads, you probably shouldn’t be going up against anything larger than small whitetail deer. LEARN TO SHOOT: The basics of handgun marksmanship are also the basics of handgun hunting marksmanship. Breath control, trigger squeeze, and follow through, are critical to delivering that well-placed shot that will humanely drop your trophy. 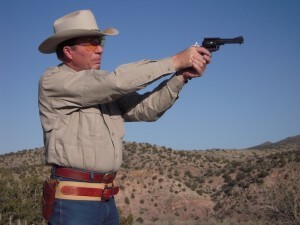 Beginners are well advised to take an NRA bullseye pistol class to bone up on the basics. BE A SPORTSMAN: If the shot doesn’t feel right, don’t try it. You may be tired, you may be sore, the light may be bad. It doesn’t matter, if the shot doesn’t feel right, don’t try it. PRACTICE, PRACTICE, PRACTICE: You might as well get into handloading, too, because you need to burn a lot of ammo getting to the point where you can feel confident hunting with a handgun. I have to practice three times as much with a handgun as I do with a rifle. You probably will, too. HAVE FUN: Shoot, practice, study woodscraft, and have a good time with the challenge of handgun hunting. There are some wonderful trophies to be had when the bullet flies true. This entry was posted in Hunting, Philosophy, Revolvers, Semi-Auto and tagged handgun hunting, handloading, sportsman, woodscraft. Bookmark the permalink.